My name is Rollyn Lee. I'm a general dentist practicing in Amery, Wisconsin. I obtained my Pre-Dentistry education at the University of Wisconsin, River Falls from 1977-1980. I then attended the University of Minnesota School of Dentistry from 1980-1985 and received my Bachelor of Science degree with honors and my Doctor of Dental Surgery degree. I firmly believe that it is important that dentists stay up to date on the changes that occur in dentistry. The materials and techniques I was taught to use over 30 years ago in dental school, in many cases, have changed dramatically or are gone altogether. l owe it to my patients to treat them with the latest materials and techniques so they receive the highest quality dental care I can provide. I attend many continuing education seminars each yearand I consider myself to be somewhat of a C.E. junky. I love to learn new things about my profession! I enjoy seminars on the following areas: Dental sleep medicine to help patients with snoring or sleep apnea so patients can breathe better when they sleep and get back to a better quality of life. Laser dentistry that makes working on the teeth and gums less painful, so we often can do treatment on my patients without the need for shots. Gum disease (periodontal disease) because new drugs, materials and techniques are coming out almost daily to help stop gum disease and possibly reverse the damage my patients have experienced. Dental materials (new filling and crown materials) that last longer and are stronger so my patients don't need to see me as often for dental work. New technology that makes my patient care faster and better so visits can be shorter. New technology also allows me to better explain and educate my patients so they can make more informed decisions on their dental care options. Facial esthetics that allow me to enhance a patient's natural smile, both dentally and with Botox and dermal fillers. Practice management so my team and I can provide consistent, friendly, patient-centered service that makes all of our patients feel like they are a part of our family at River Place Dental. I participate in C.E. because I always want to do my job better than I did the day before. My patients deserve the best dentistry I can do using state-of-the-art materials and techniques. I am most passionate about creating an atmosphere that makes my patients say "That was much better than I was expecting!" or "That was the best dental visit I've ever had!" I try very hard to put myself in my patient's situation because I have had a lot of dental work including root canals, crowns, extractions, braces and fillings. Much of it when I was young was painful and terrifying. It left scars for years. I really want my patients to never have to experience what I had to go through for my dental care. I treat every patient as if they were a member of my family. What most excites you about your work? I get the most enjoyment and excitement about dentistry when I hear patients say they can smile again or chew again without pain. I love being able to change their lives. I love talking with my patients! My team would say I love it too much. I enjoy talking about just about anything with my patients from their families, trips, outdoor activities, pets and hobbies to bad jokes and puns that make them groan a little. As one of my dental assistants said to me: "I have a sense of humor. I just don't like yours!" Ouch! Anyone reading this has been warned. I have been practicing dentistry for over 30 years. I have seen dramatic changes in dentistry over that time and can only wonder what changes will occur over the next thirty years. Why did you choose to join the oral healthcare field? I knew growing up that I wanted to be a helper: a physician, dentist or veterinarian. In my early teens, I had a life changing event that persuaded me to become a dentist. A college friend of my parents was a dentist who had known me since "Before I was born," he would say. He took over my dental care and made me realize that dental care didn't have to be like what I had previously suffered through. I saw how he interacted with his patients and how there was laughter in his office and people weren't walking out in pain. I used him as a mentor and role model and decided to be a dentist so I could help other people overcome their fear of going to the dentist. My team is exceptional because we all feel like every patient is a family member. We only want the best for our patients and try hard to create an atmosphere that is relaxed, fun, educational and non-threatening. I try to create a bond with everyone I see during the day and that means taking time to get to know everyone and what's special to them and about them. Everyone is unique and that allows me to learn many new things from my patients every day. I never want a patient to leave River Place Dental and feel like they didn't get the attention they deserved from me or anyone on my team. Almost any dental office can do the technical dental work but my team and I want to be known as the place, that really cares about our patients and will spend the time to listen to you and what's important to you. I think what is special about me and my team is the way we have fun with our patients. We want people to laugh and enjoy their time with us, not dread coming in. We like to have fun at River Place Dental! There should be someone laughing somewhere in the office at all times. Dentistry and going to the dentist doesn't have to be serious, boring and dull. For families with small children, we have 32" monitors in each room so kids can watch Netflix programs or cartoons to help pass the time. I was born in Stillwater, MN and lived in the Bayport/Stillwater area almost all of my life. I am a lifelong St. Croix River Valley resident even though I now live in Amery, WI. Where do you live now and how long have you been there? I moved from Stillwater to Amery back around 2000. I have lived in my current location since 2005. I am married and have two adult sons. My wife, Carrie, has been a major architect and strategic planner for River Place Dental. We wouldn't be in our new facility or had the success we've had if she hadn't been involved. She is a pharmacist as well as a business consultant and high performance coach. She has degrees in equestrian science, accounting, a law degree and a Doctor of Pharmacy degree. She loves helping companies and entrepreneurs become more successful through accountability, systems implementation and mastermind sessions. My sons, Carl and Rick, are currently 23 and 26 years old. Carl is at UW-Madison working toward a Computer Science degree and Rick is at William Mitchell College of Law and working toward his law degree. The house would be pretty quiet since both boys live at school, however, we have six Labrador Retrievers to keep us occupied and they are all in the house. We have 2 chocolate labs, 2 black labs, 1 yellow lab and 1 silver lab. If anyone knows of a commercial use for Labrador hair, please let me know! When I'm not working, I enjoy golfing, playing cards with friends, traveling for leisure and continuing education courses, meeting new people and learning about what their stories. I love dogs and animals in general. I would love to have an animal rescue shelter someday. River Place Dental contributes dental supplies and financial support to many groups and programs in the Amery area. We sponsor the fireworks display during the annual Light Up the Park celebration in Amery. 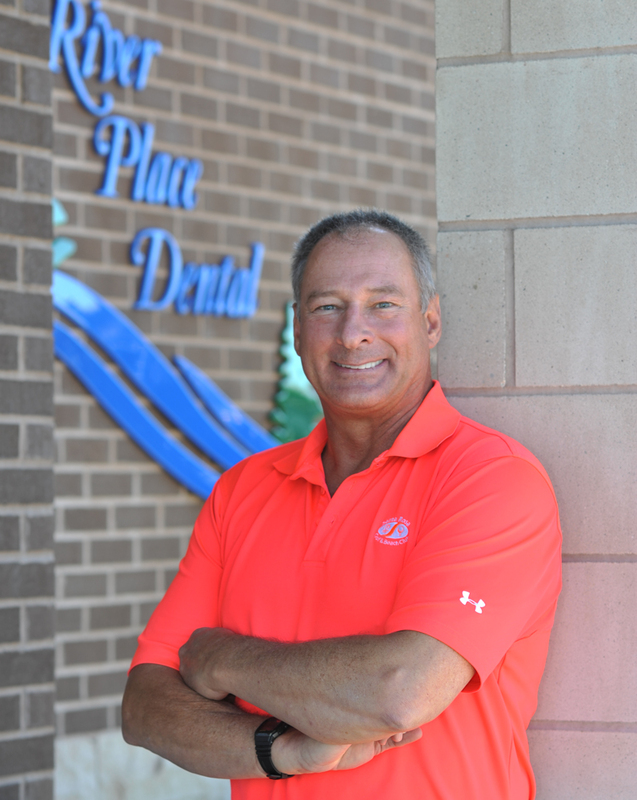 I believe it is important to give back to the community in as many ways as possible to help those who make my dental practice possible in the first place. I am the only left-handed person in the office so that makes me the only one in my right mind! I believe the profession of dentistry to be one of the most important professions existing today. The first thing most people notice about someone else is their smile and teeth. Our smile often determines the mindset we have about our lives. If we have a smile we enjoy, we are confident, upbeat, outgoing. However, if we don't like our teeth and our smile, we are often subdued, shy, afraid to let others see our teeth. As a dental professional, I can literally change a person's life by changing how they feel about their teeth and their smile. Not many professions have the power to change a person's life to that degree and that's a responsibility I take very seriously. Also, people are living longer and need to have teeth to chew and maintain daily nutrition. It is heartbreaking to see people that have neglected their teeth and are suffering throughout their entire body because of poor nutrition caused by the inability to eat properly. The dental profession is also becoming an important component in oxygenation and sleep apnea. That is another area that is truly life changing for people. The mouth is an important portal into the body and dental professionals are gatekeepers to help keep bad things away.